Mano a Mano has been guided by the simple yet powerful premise that groups of committed volunteers can reach across national boundaries to make a dramatic difference in the lives of others. The power of this premise has been demonstrated by the extent to which the organization’s scope and accomplishments have in such a short time expanded to exceed even our most ambitious dreams. Our mission: to create partnerships with impoverished Bolivian communities to improve health and increase economic well-being. 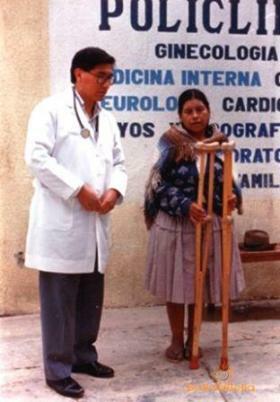 For many years, one of the organization's founders carried small medical donations to his native Bolivia when making yearly visits to his family. Having extensive personal contacts with health care providers there, he could see first-hand the desperate need for these gifts and know how they were used. His contacts with Minnesota hospitals and clinics made it clear that many of them store and then ultimately discard usable supplies, instruments and equipment because they cannot afford to pay staff to sort it for use or resale. Over the years other interested persons began to assist in this effort to redistribute medical surplus. In October, 1994, that group of volunteers incorporated Mano a Mano (Spanish for Hand to Hand) as a non-profit, tax-exempt 501 (c)(3) organization and began to dramatically increase the scope of its activity. The organization’s accomplishments have since grown to include building an infrastructure for health care, education and economic development in Bolivia that is constructed, supported, and ultimately run by Bolivians. The organization operates through a uniquely effective, largely volunteer network. Its administrative and fundraising costs remain at less than 5%. Mano a Mano, in collaboration with the local community, has been working on a large water reservoir in Choquechampi, Bolivia. When completed, the reservoir will hold 800,000 cubic meters of water and irrigate the fields of 400 local farmers. We are expecting a doubling or tripling of the farmers' annual income in the first year of operation due to the increase in water availability for their crops; this has occurred in every reservoir project we have done to date. Choquechampi is Mano a Mano's third major water reservoir in Bolivia. See photos on Flickr. In 2009, nine medical staff members from Regions Hospital traveled to Cochabamba to provide a training conference on emergency medicine for Bolivian medical professionals. More than 350 people attended! Participants included staff from Mano a Mano's network of 101 health clinics, as well as staff from other Bolivian health organizations. This conference provided a superb training opportunity for a wide audience, and addresses our mission of building capacity in Bolivia. This was the second conference of the year for the Regions medical staff. We have accomplished a lot this past year with the support of our incredible donors and volunteers: surpassing 100 health clinics built throughout Bolivia; nearing completion of our 3rd major water reservoir project; and expanding our aviation program by adding a second hangar, which has now provided almost 500 emergency airlifts, among many others. But we still have a lot of work; there are more than 250 outstanding requests by local Bolivian communities for healthcare clinics alone. 1. Join the conversation: Click on these links to our Facebook, Twitter, and YouTube pages. Follow Mano a Mano on any of these social media sites, learn more about our projects and events, and become a part of our online community. Ask your friends and family to follow as well. 2. Tell a friend: Help Mano a Mano spread the word. Forward this page to people who you think would be interested in us simply by clicking the share buttons at the bottom of the page to upload it to your own social network. 3. Shop online through Goodshop. 4. Are you looking for a non-traditional gift? Consider going to Alternative Gifts: Click here to learn more.